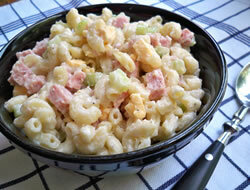 A tasty pasta salad the makes a great side to any grilled or roasted meat. 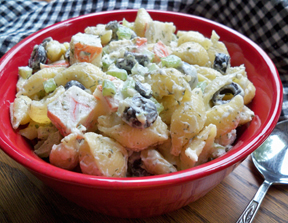 It makes a large salad that is perfect for taking to potlucks or family gatherings. Also, makes a nice dinner salad for those nights you want to eat a little lighter. 1 quart veggies of choice, chopped or grated, such as: broccoli, cauliflower, carrots, squash, onion, grape tomatoes or red or green peppers. Cook pasta as directed - do not overcook; drain well. Chop veggies and place in large bowl. 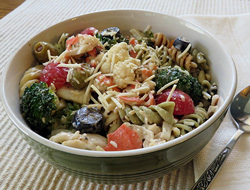 Put drained pasta directly over veggies and pour the salad dressing over the pasta. Let stand 10 - 15 minutes. 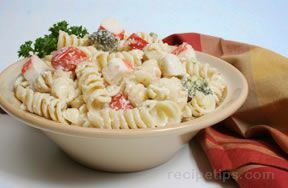 Mix mayonnaise, cheese, crab meat, black olives and green olives together; mix in with the vegetables and pasta. Sprinkle with garlic and basil; mix gently. Best to let set overnight in refrigerator. May add more mayonnaise or dressing, if desired. "I was a little leary of mixing vinaigrette with miracle whip in the same salad because I was not sure how that would taste but it turned out a lot better than expected. I also wasn't sure about the basil being added but again it was ok. I should have halved the recipe for just us but it would be a nice size to take to a potluck."